When this lady talks, I listen. When most people talk about “goal orientation” they generally mean “how motivated are you to achieve your goals?” While this question may be fine for most people, I don’t think it helps most people. Reflecting on HOW motivated you are to achieve something may in fact actually lessen your drive (I’ll explain why in a future article). So if you’re going to do some soul-searching, spend your time taking a sober look at WHAT motivates you. 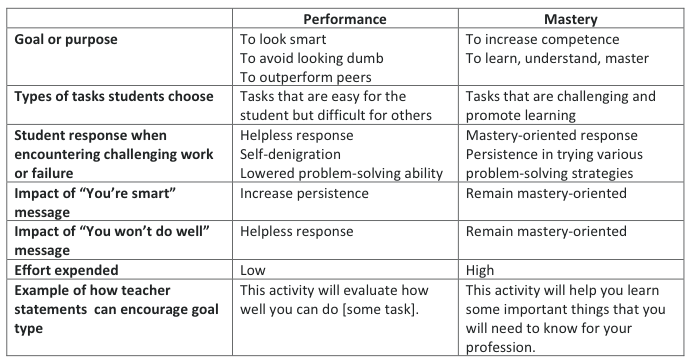 This is precisely what psychologist Carol Dweck had in mind when she conducted her research on school children in the late 1970s. So, no more descriptions. What does all of this mean for you? Well, first you need to determine which one of these boys seem most similar to you. Do you like to demonstrate you expertise by accumulating achievements or do you prefer to challenge yourself for even if you get in over your head? In general, are you more motivated to master skills or to master others? Understanding where you are is important because it shows you where you may need to grow. In fact, researchers now believe that these orientations, while pronounced and distinct in children, may become complementary in adults. That is, while children may be labeled high in learning orientation OR high in performance orientation, adults may score high on performance orientation AND learning orientation. In this way, you’ll want to build up these motivating forces simultaneously and avoid letting one dominate your life. Remember, if you want to succeed then you’re going to have to learn your own weaknesses and temptations (see “Manage Your Temptations”). If you’re completely performance oriented then you may avoid important learning situations in which you may appear incompetent. Conversely, if you’re completely learning oriented you may leave many projects unfinished because the novelty of the challenge has worn off. The key is to know yourself and know when you are just making excuses. You want a real success secret? Understand this principle: achievement without mastery is temporary; mastery without achievement is delusion.